Are you ready to have some fun? If so, you will not want to miss these attractions during your vacation to Branson! The Track Family Fun Parks offer guests of all ages something to enjoy! From bumper-boats, go-karts, and mini-golf, to rides on the new Branson Ferris Wheel, everyone in your group will be sure to have fun! Branson also has several new attractions that just opened recently! For the thrill seekers in your group, be sure to visit Branson’s Bigfoot on the Strip! The Bigfoot Action Tower takes guests to an incredible height of 200 feet before allowing them to free-fall back down to the ground. On the Bigfoot Saddle Sling, guests will be launched into the air and will then flip over numerous times before descending back down. 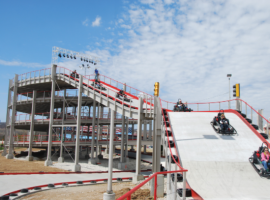 Another new attraction in Branson is Fritz’s Adventure Center. This indoor attraction offers guests the opportunity to explore underground tunnels, climb on a towering ropes course, or even rock climb! With so many attractions in Branson, you’re guaranteed to have a great time!